Green conference at the weekend voted to back fundamental changes to the party's structures, which will now go to an all-member vote. Natalie Bennett explains the move. 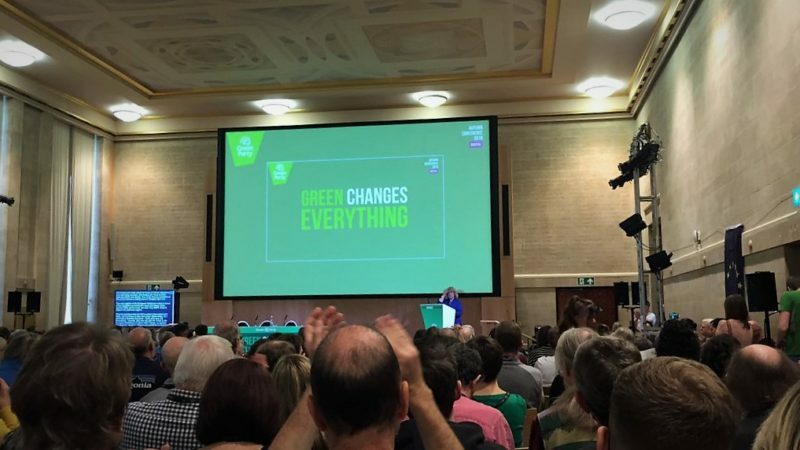 Green Party conference – in the magnificent setting of Bristol City Hall – produced a curious sense of déjà vu for me last weekend. For this was the venue, six years ago, where I spoke at my first event as Green Party leader, only days after I’d been submerged into the whirlwind of being elected, to a level of attention that looks meagre now, but that almost overwhelmed the scant resources of the party at the time. At the time, John Harris of the Guardian couldn’t get over the fact that when he came into the press office, it was I who explained the schedule to him, since our two press officers and one volunteer were otherwise occupied. And a kind Channel Four producer provided me with essential advice on wardrobe that no one else was equipped to offer. It feels more like decades than years ago to me, so much have I and the Green Party been through since – the Green Surge, the 2015 election at which we got more votes than every other election previously added together, along with the disappointment of failing to send more MPs to join the brilliant Caroline Lucas. But at this conference, the party members, through collective attendance at long hours of plenary sessions, delivered a step towards changes that could be even more substantial and significant then the five-times multiplication of the party’s membership and growth in impact that we’ve seen since 2012. Constitutional change can sound dull, and dry, and I can only apologise to the party members who didn’t get their exciting policy proposals heard this time due to the dedication of sessions to the review. But I want to say thank you to the thousands of party members who fed into the Commission’s report, by far the largest consultation carried out in our party’s history. What they said was that the structures we have now is getting in the way of what we need to do. At present, members struggle to understand how to get things done – too many different bodies need to be consulted without clarity as to who makes a final decision, and we’re far too often burning people out with more work than can in any way reasonably be asked of volunteers. Our new co-leaders Sian Berry and Jonathan Bartley told us, rightly, that the Green Party needs to be preparing to form a Green Government – to be ready for a new Green Surge that makes the last look small. As the IPCC report out this week showed, the world cannot wait for others to adopt, partially and inadequately, the transformatory policies that the Green Party has developed and refined over decades. The Green Party is pointing out the unavoidability of massive system change, in a world of economic, social, environmental, educational and political crisis. It is hard to do that from within structures that have hardly changed in 30 years (there was a restructuring of parts of the governance in 1991), based on a constitution that was written more than 40 years ago. So what the Holistic Review proposes is changing from a complex system of committees to a single, large council – not a committee but a representative body to get things done and make decisions between conferences. Conference will still remain our supreme decision-making body. The council will operate through “task and finish groups” to complete the work that needs to be done. That’s a clunky-sounding name, but worth keeping, I think, for it sums up exactly what they are: groups of people who volunteer to do a time-limited role, with a concrete outcome at the end of it. The other is the political executive, PEX for short. This aims to be a more transparent, inclusive way of bringing our council and parliamentary reps into decision-making, particularly day-to-day calls that need to be made in reaction to events. None of this will change one of the greatest aspects of the Green Party, its democracy. Policy will still be made by members, at conference. And conference made some changes to the Commission’s proposals, on a special focus on international work, allowing jobshares, and on the regularity of PEX meetings. The proposals will now go to members in a referendum. Yes, we continue to believe in direct democracy in the Green Party. And in it we have an informed electorate allowed to have a genuinely interactive, cooperative democratic say in the way its problems are approached. Something of a model for the country there: you might say the parallel would be a People’s Constitutional Convention to make the UK a democracy at last. Natalie Bennett is former leader of the Green Party and writes regularly for Left Foot Forward.